Marisol Rendon, So Dragons Do Exist, 2013, wood, fabric, lights, dims variable, Luis De Jesus LA. LOS ANGELES, CA.- Luis De Jesus Los Angeles presents Marisol Rendón in her first Los Angeles solo exhibition, titled So, Dragons Do Exist? (Considerations of the Unavoidable Syndrome of Illusion), on view from May 18  June 29, 2013. An artist's reception will be held on Saturday, May 18, from 68 pm. Marisol Rendón pursues an interest in the metaphorical and quasispiritual existence of objects. She tirelessly searches for traces of human thoughts, hopes and emotions as encapsulated and expressed in the articles of our daily lives. Illusion is an element that has always intrigued her. "We inhabit a world in which we unceasingly look for a way, any way, to justify the difficult and sometimes the impossible.' says Rendón. 'Maybe people hold onto illusions to make themselves feel more comfortable. To give themselves a chance." Marisol Rendón grew up in Manizales, Colombia, surrounded by poverty, where hope itself was often an illusion as people clung to myths and superstitions to help them through their everyday life. "Illusion is a very imperfect concept. It's about something that doesn't really exist; or it does exist but it is so ambivalent that's it's hard to understand exactly what it is." In her work, Rendón tries to capture the moment when people see through their selfdeceptions  when life forces them to shed a dream and they have to find some other way to keep going. 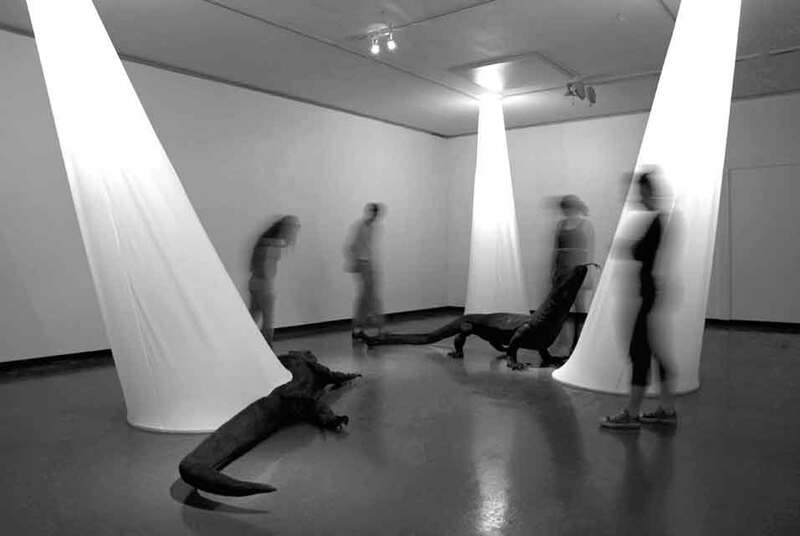 In So, Dragons do Exist?, Rendón uses the image of the Komodo dragon to negotiate the interaction between our need for hopes and illusions, and myths and dreamswhich allow us to face the unknown with wonderand the cognizance it takes to make the right choices. The reality of the Komodo dragon is that of a living dinosaur: they are massive, exotic creatures. However, compared to images of fire breathing, winged beasts as conjured by their name, they can't help but disappoint. In So, Dragons do Exist? Rendón presents us with an opportunity find a balance between the dualities in our existence in a moment of empathy and contemplation. Marisol Rendón (Colombia, b. 1975) earned her MFA (2003) from Claremont Graduate University, CA, and studied at the Skowhegan School of Painting and Sculpture, Maine. She also holds degrees in Fine Arts from Caldas University, Manizales, Colombia, and Semiotics and Hermeneutics from the National University of Colombia, Medellín. Upcoming exhibitions include Wobbleland at the New Children's Museum, San Diego, CA. Other recent exhibitions include Ojalá (Considerations of the Unavoidable Syndrome of Illusion) at Boehm Gallery, Palomar College, CA; Here Not There: San Diego Art Now, and Drawing the Line, both at the Museum of Contemporary Art San Diego; The 43 Uses of Drawing at Rugby Gallery & Museum, Midlands, UK; An Interactive Experiment in Art at the California Center for the Arts Museum, Escondido, CA; Irrational Exhibits Five, Track:16, Santa Monica, CA; and Hello, is your refrigerator running?, at b126 Gallery, Zurich, CH. She is currently professor and chair of the Fine Arts Department at Southwestern College in San Diego, where she lives and works.